Bacteria recycling lets you sacrifice unneeded Evolved Bacteria to obtain a random reward. It is unlocked after destroying the 9th planet - Xutrutis. 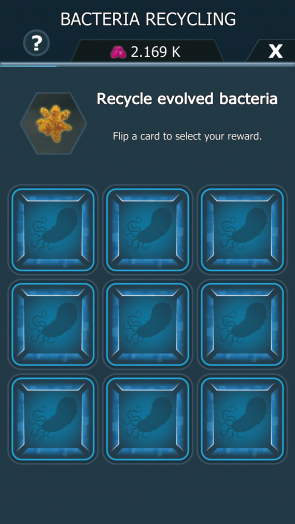 Upon recycling a Bacteria, 9 to 25 cards appear on the screen. 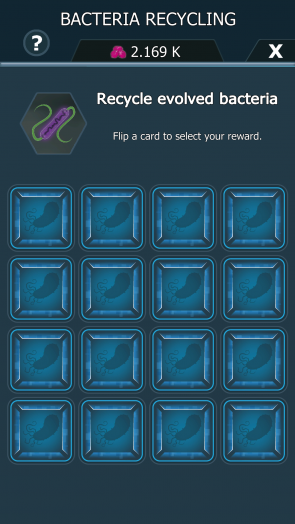 The recycling rewards are divided into four tiers with each tier consisting of up to seven different rewards. 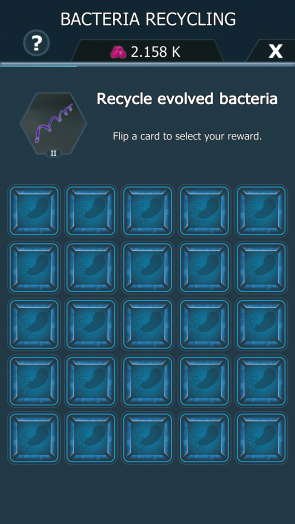 The possible reward tiers and the number of cards displayed are determined by the bacteria value coefficient (BVC). Bacteria Recycling is the only Research Lab that doesn't directly require Scientists. It was first added to the game with version 1.3.0. The recycling result depends on the BVC of the sacrificed Evolved Bacteria. Gives the player some regular Bacteria. The amount gained is calculated from currently owned Bacteria. Gives the player some Gene Strands. The amount gained depends on the current planet without taking into account any bonuses to Gene Strand drops (such as from equipped Evolved Bacteria). The more Gene Strands would be gained from completely destroying the initial population of the planet, the bigger the Gene Strand reward from recycling. The recycled Evolved Bacteria is lost and a new Bacteria of the same rarity and level is obtained. The new Bacteria can have a different name and image and its irradiation level is reset to 10%. Random LV1 x1-2 - obtain 1-2 random LV1 Evolved Bacteria. The rarity of Bacteria obtained this way can be increased by Genome Corruption. Good LV1 - obtain a random LV1 Evolved Bacteria of a higher rarity. This is not influenced by any outside sources such as Genome Corruption. The chances are: 50% for rare, 47% for legendary and 3% for mythical. Get a BPS boost that increases your BPS by a certain multiplier for a duration. The possible multipliers range from x5 to x1000 and the duration ranges from 5 to 20 minutes. The reward is stored in your boost inventory, which is available from the main screen. Get a BPC boost that increases your BPC by a certain multiplier for a duration. The possible multipliers range from x10 to x1000 and the duration ranges from 5 to 20 minutes. The reward is stored in your boost inventory, which is available from the main screen. Each reward within a tier has a different probability (i.e. weight) of appearing. Bacteria Value Coefficient (BVC) determines the number of cards that will be displayed when recycling an Evolved Bacteria as well as the rewards contained by these cards. • Tier 3 rewards have smaller chance of giving a Level 3 legendary Evolved Bacteria. • Gene Strand reward no longer depends on currently owned Gene Strands. 1.3.0 Introduced to the game.